Just when I was beginning to think that our wet beginning to 2012 was over, here comes the rain again. In my yard, we've gotten 0.8 inch in the last twenty-four hours. It was most welcome because the soil had dried out since our last significant rainfall a couple of weeks ago. I had actually gone so far as to water a few plants that seemed thirsty this week. Once again, Texas finds itself in the above normal category. What I find particularly interesting is that all across the northern tier of states from Montana to Maine and right through much of the Mid-West and down to Alabama and Florida, the temperatures have been "much above normal" this winter. I haven't heard Sen. Inhofe and his posse saying that this proves there must be global warming, as they loudly proclaimed last winter to anyone who would listen that the cold winter proved there was no such thing as global warming! I won't hold my breath. This week, I've been fighting a plague of cutworms in my vegetable garden. I've lost two tomato plants, three eggplant plants, and a pepper plant to the dastardly larvae. I've destroyed all that I've been able to find and my garden has been free of further damage for a couple of days now, but I dare not relax my vigilance. Aluminum foil wrapped around the stem of the plant is an effective way to protect plants. If only I had known when I put my plants into the ground that I was going to have this problem, I certainly would have wrapped them and saved myself the sorrow of losing plants in which I had invested much time and care. There is also, I've just learned, a product called "Garden Pest Bait" from GardensAlive.com that is alleged to be effective against these pests as well as snails, slugs, earwigs, sowbugs, pill bugs, etc. I think I may just have to order some and give it a trial. My big project for this week has been cutting back the wild hedge at the back of my yard. It has plants that have been planted over the years by birds and other animals. Things like elderberry, greenbriar, pokeweed, beautyberry, Virginia creeper, and trumpet vine. It is a wild tangle that the birds love and that is why I tolerate it. Periodically, I threaten to hire someone to cut it down, dig it out, and create an actual bed there where I can put plants of my choosing instead of the birds, but so far I haven't done it. Anyway, I have to cut it back occasionally or it grows completely out of hand, and this was the week I chose to do it. I almost got it finished but then the rains came, so the last few feet of the hedge got a reprieve until later. In other parts of the garden, blooms are popping up everywhere. 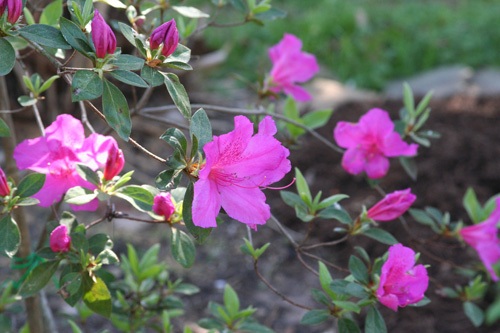 Among the "poppers" was this old azalea. When I see it blooming, I know that spring has truly arrived. "Beans on the balcony." I like it, Snap. Loving the rain here too Dorothy. We had another dry spell there and I was starting to get worried! The wetness has been very welcome indeed, Jayne, and it looks like it may last for a couple more days.